Harrington Hall is centrally located with one of Dublin's most fashionable addresses. It is situated on Harcourt St. off the south west corner of St. Stephen's Green. It is on the LUAS (tram system) line which services from Grafton Street (one stop) to the north and to the Green Line Sandyford in the South. Grafton Street and its surrounds would arguably be Ireland's most exclusive shopping district. 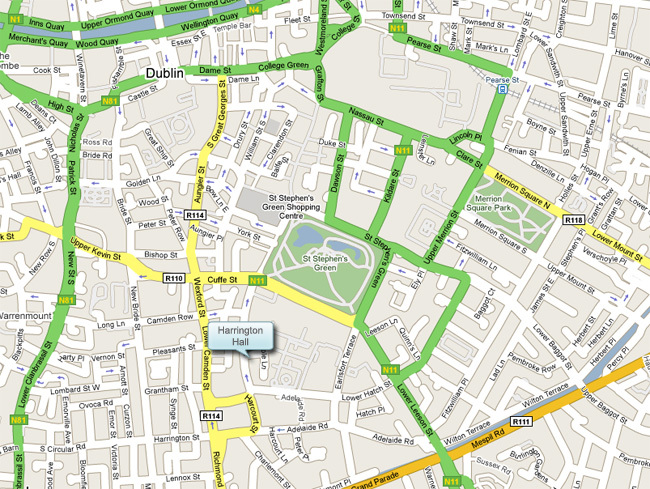 Temple Bar and all Dublin's major attractions are all within walking distance of the hotel. Harrington Hall has its own private car park exclusively to its guests. This facility is offered free of charge on a first come first served basis. It can not be reserved in advance ( having said this because we have yet to run in to problems!). Alternatively there is a multi storey 24 hour car park locally available at the Royal College of Surgeons ( west side of St Stephens Green ). Overnight rates from 5 Euro ( 4754943 ). Guest Rooms: All rooms are ensuite with direct dial telephone, multi channel TV , tea /coffee hospitality tray, hair dryer, garment press & central ceiling fan. Location: Harrington Hall is on Harcourt Street, which enters the southwest corner of Saint Stephen's Green. It is less than five minutes walk from Grafton Street at the heart of Dublin's city centre. Most major shops, restaurants, theatres and pubs can be reached on foot. Restaurants: Breakfast in the Harrington hall is a special treat. Apart from the Traditional Irish breakfast you can sample our speciality omelettes, pancakes & fish dishes. Freshly squeezed fruit juices, copious amounts of fresh fruit, yogurts and freshly baked breads are order of the day. Service menu is served daily from 2.30pm to 11.00pm. Here you can choose from a wide variety of hot and cold snacks. It includes soup of the day, smoked salmon, wraps, hot sandwiches, cheese selection and a fruit basket option. We offer a selection of wines by the bottle or 1/4 bottle, Cava and champagnes, bottled beers, spirits and of course soft drinks.